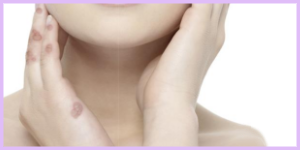 This Nordlys Ellipse IPL laser effectively treats a wide variety of skin conditions, including bothersome “port wine stains“, by using a combination of fractional and infrared lasers in one device that can cover both small and large areas of the body. Birmingham AMAE Med Spa is one of the few facilities in Oakland County to offer this fast, comfortable, affordable, high-tech laser skin care treatment. In this article we discuss how the Nordlys Ellipse IPL laser treats port wine stains. Port Wine Stains are technically a type of vascular lesion – essentially caused by the same condition thate creates broken veins or “spider veins”. Most Port Wine Stains are present from birth and are often simply refered to as “birth marks”. However other vascular lesions may develop with age, or as the result of such as sun exposure or other environmental damage. While some individuals embrace their Port Wine Stains as a part of their unique identity, others choose to seek professional help to remove them. Sadly, in children and teens, Port Wine Stains can also lead to teasing and bullying – leading concerned parents to look for a treatment. For centuries, Port Wine Stains have been covered with make-up, since there were no medical treatments. Even recently, vascular removal surgery has been limited to the larger blood vessels – like those on the legs. The great news for individuals with Port Wine Stains is that effectiver and affordable laser treatments are now available at our Birmingham, MI Med Spa. We offer Ellipse Laser Selective Waveband Technology (SWT®), which treats even the most difficult vascular lesions and Port Wine Stains successfully and without pain. This state-of-the-art laser procedure targets and detroys the blood vessel(s) supplying the lesion with blood. 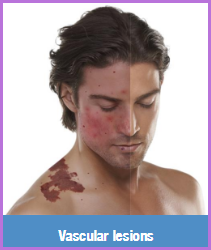 Over time the Port Wine Stain (vascular lesion) disappears, restoring the skin’s natural appearance. More specifically, the IPL Laser works by directing controlled pulses of specific light frequencies into the upper skin layer. The light is absorbed by the hemoglobin in the blood that is in the blood vessels feeding the Port Wine Stain. The light energy is then transformed into heat, which damages the walls of the vessels. The light produced by the Ellipse systems is carefully controlled to produce the correct wavelengths and pulse lengths to destroy the targeted celss without damaging surrounding tissue. If you or your child is tired of trying to hide or explain their Port Wine Stain, there is finally an effective, painless and affordable treatment! Birmingham double board certified plastic surgeon Dr. Ali offers the absolute best, state-of-the-art technologies in skin treatments. In addition to Nordlys Ellipse IPL laser skin treatments, we also offer Fraxel 1550 laser treatments as well as ThermiSmooth radio frequency skin treatments. Each laser skin treatment begins with a thorough and caring professional skin consultation. Laser treatments are selected and optimized to meet the specific needs of each individual client with the most innovative and comprehensive products and technologies. For optimal results we also offer custom packages of laser treatments, under the guidance of medical aesthetician Ramona. Schedule a laser Port Wine Stain treatment – and then relax in our Birmingham Med Spa, while we make you look and feel more confident and attractive!